In 1949 the French engineer, Louis Armand, was named General Manager of the SNCF ( (Société nationale des chemins de fer français or "French National Railway Company"). During his tenure he worked very hard to establish electrification of train lines in AC voltage. 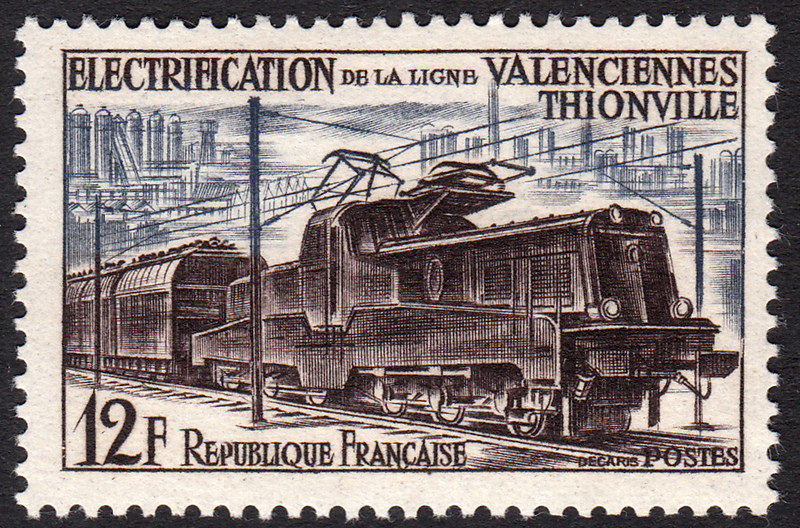 In 1953 (I think that is the date) the Valenciennes-Thionville line - the main industrial artery in north-eastern France - was electrified using single-phase alternating current. This improvement helped to increase critical shipments of coal, iron ore and iron and steel products. 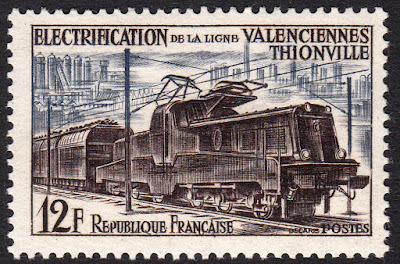 On 11 May 1955, France issued a stamp to promote the electrification of the Valenciennes-Thionville line. The stamp was designed and engraved by Albert Decaris. Now I have to say, I know next to nothing about trains, so it took me quite some time to work out what type of train is depicted here. But I believe I have cracked it! Initially I thought that the locomotive was a BB 12000 class. But it just didn't quite look right. There was no apron between the front and rear drive wheels, which the locomotive depicted clearly has. Then I found a short video in French that shows the exact train in the stamp. I now think the train is a CC 14000 class locomotive. If there are any train buffs out there who can confirm this one way or another, I'd love to hear from you.